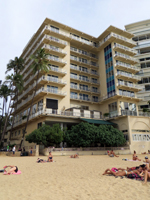 Waikiki Beach Hotels: A Local Resident’s Perspective. Finding Waikiki Beach Hotels... Simplified! If you’re thinking about staying in one of our Waikiki Beach Hotels during your Hawaii vacation you might be wondering where to start your search for the perfect place. That’s where I think I can help you. I know from my own personal hotel researching experiences that every time I go on vacation that no matter what I type into the search engine, it’s going to bring back results for everything within 50 miles or more. That’s not real helpful. So I’m going to try to help narrow and focus your efforts so that you don’t have to waste a lot of time looking in all the wrong directions. If you want to browse all Waikiki hotels and/or start comparing rates immediately, try this (ad): Hawaii Vacations: Save 30% or more in paradise! . Otherwise keep reading below (link opens a new window/tab). You may have heard that Hawaii has great, warm weather year-round. Those rumors are true. The proof is in these photos – almost all of which were taken on a beautiful beach day in the middle of December. 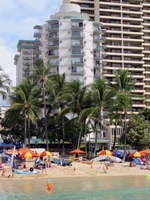 In this article I’m talking exclusively about Waikiki Beach Hotels. By that I mean hotels and resorts that are located in Waikiki and have direct access to Waikiki Beach without any other hotels or stores in-between. I feel that it’s necessary to clarify that specifically because there are a lot of Waikiki hotels that don’t front the beach even though they have magnificent views of the beach or they’re within walking distance of the beach or they just have names that sound beachy. 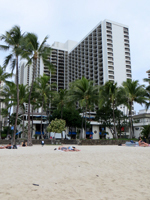 I talk about the other off-beach Waikiki hotels throughout northwest, central, and southeast Waikiki on some other pages. But this article is exclusively about prime beachfront real estate in Waikiki. And to prove it, I took pictures of every one of these hotels from the beach so you could see it for yourself. By my count, that’s a total of 16 properties (not counting the Hawaii vacation condo rentals, which will also be discussed in another article). For starters, you should know who I am so you can understand my perspective. If you’re familiar with the rest of my site, you know that I’m a long-term Oahu resident who likes living as if I’m on a family vacation in Hawaii. Nevertheless, on Oahu, I sleep at home – not in an Oahu hotel. Nor do I work for any of the Waikiki Beach hotels that I’m discussing. So my perspective is unbiased, but it’s also uninformed when it comes to specific details about most of the guest rooms (although I have been in the guest rooms at a few of these hotels). I have, however, been to many of these hotels for meals, entertainment and various events. So I think that qualifies me to give a somewhat objective and informed opinion about how a visitor might look at these Oahu lodging options for the first time. Thus, I’ll be discussing the purely external factors that might affect where you want to stay. I’m only attempting to help you point yourself in the direction you prefer. Then it will be up to you to thoroughly research the hotels that interest you most and read guest reviews, etc. Of all the great Waikiki Beach resorts, this one is my favorite. I have been in the guest rooms here; and although they weren’t the grandest standard rooms** I’ve ever been in, they were certainly quite a bit better than the typical box with a bed. Anyway, outside of the guest rooms, this Hawaii vacation resort is just fun. It has its own lagoon, a fantastic section of beach, great swimming pools, great entertainment, beautiful gardens, exotic animals (penguins, macaws, sea turtles and more), beautiful artwork, good restaurants on the property, and it has a free fireworks show every Tuesday and Friday night! 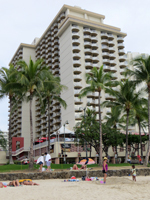 This hotel is located farthest to the West of all Waikiki Beach hotels, which places it close to Ala Moana Shopping Center and other things to do in Honolulu. Of all the Oahu resorts, this is the one that I would be most likely to book for my next staycation. The only potential negative about this location is that if you really want to try surfing in Hawaii it’s a rather long walk down to the best beginner surf spot behind the Duke Kahanamoku statue. I found cheaper rates for this resort at (ad) Hotels.com : search keyword "Royal Hawaiian Resort". Dubbed the Pink Palace of the Pacific, this iconic Waikiki landmark is the second oldest hotel on Waikiki Beach. But instead of feeling old, it just feels really classy. As long as you can handle seeing pink everywhere you go, you’ll probably love it – and you’ll never have trouble finding your hotel. It too fronts a fantastic section of Waikiki Beach, has beautiful gardens, and great entertainment. Best of all, this hotel is located in almost the exact middle of Waikiki Beach, so it’s central to all the fun things to do in Waikiki. Unfortunately, I’m fairly certain this hotel has absolutely no view of the Hilton fireworks. Check Rates and Availability at (ad) Hotels.com : search keyword "Sheraton Waikiki". As far as I can tell, this is the largest single-building hotel on Waikiki Beach. And it’s one of the two hotels closest to the water’s edge. So if you get an ocean view room it’s certain to dazzle. Of course, the Waikiki views are also amazing. On the flipside, however, there’s only a narrow stretch of sand for you to lie out on the beach directly in front of this hotel, and one portion of the beach had to be replaced with a concrete breakwater wall and sidewalk just to keep it passable… (of course you’re welcome to walk a few meters to a wider stretch of beach). It has a beautiful pool with one small waterslide and chaises actually in the pool (on a ledge). I’ve been to concerts, banquets, and events at this hotel. But the most fun I used to have at this hotel was just hanging out in the lobby watching all the people. I think this place has the busiest lobby I’ve ever seen. Finally, this hotel is located right next to the Pink Palace, so it’s central to all of Waikiki. I’ve never stayed in a guest room at this hotel, but my wife has, and she loved it. Check Rates and Availability at (ad) Hotels.com : search keyword "Moana Surf". As the oldest of all the Waikiki Beach hotels, I’ve already talked about the Moana Surfrider’s historical significance elsewhere. But beyond that, it is a beautiful old building that also feels very classy. Its beachfront restaurant is literally spilling out onto the sand. And speaking of sand… from west to east, this is the second to last Waikiki Beach hotel actually built out onto the sand. The last one is located all the way down at the foot of Diamond Head, and the others in-between are across the street from the beach (though still with unobstructed direct beach access). Again from west to east, this hotel is located two-thirds of the way to Kapiolani Park, which places it right next to the Duke Kahanamoku statue and the best beginner's spot to try surfing in Hawaii. Unfortunately, I’m fairly certain this hotel has absolutely no view of the Hilton fireworks. I found cheaper rates for this resort at (ad) Hotels.com : search keyword "Hyatt Regency Waikiki". 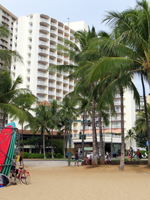 Continuing along Kalakaua Avenue from west to east, the Hyatt Regency is the first of the Waikiki Beach Hotels that’s located on the mauka (mountain/inland) side of the street with unblocked access to the beach. I’ve only been to this hotel for banquets and receptions; but based on those experiences I can tell you that it’s an impressive hotel. It’s located directly in front of the Duke Kahanamoku statue looking out the surfboard rental outfits and the best beginner surfing spot in Hawaii. It’s approximately five blocks east of the center of Waikiki and about the same distance from the edge of Kapiolani Park. As far as I can tell from the ground, there’s probably an outstanding view from every room in both towers. Unfortunately, I’m fairly certain this hotel has absolutely no view of the Hilton fireworks (except maybe from the upper floors). Check Rates and Availability at (ad) Hotels.com : search keyword "Pacific Beach Hotel". My wife and I stayed in one of the guest rooms at the Pacific Beach Hotel on our wedding night; but that was 20 years ago, and I really wasn’t paying much attention to the room at the time. I’ve also been there for several events and meals. Of all the budget Waikiki Beach hotels, this one appears to be the largest and the nicest. It’s located only three blocks from Kapiolani Park and just one block from the Duke Kahanamoku statue and the rental surfboards. But what really makes this hotel unique is its Ocenarium Restaurant, which surrounds a three-story, 1-million-plus liter (280,000 gallon) saltwater aquarium. If I had a limited Hawaii vacation budget, this is probably the first place I would try to stay. 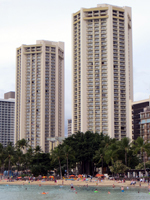 Check Rates and Availability at (ad) Hotels.com : search keyword "Aston Waikiki Beach Hotel". From a vantage outside the guest rooms, the Aston Waikiki Beach appears to be one of the two or three nicest of the budget Waikiki Beach Hotels. I especially like it at night when it’s lit up like a volcano glow. Continuing along Kalakaua Avenue from west to east, this is the second to last hotel located on the mauka (mountain/inland) side of the street directly across from the beach. It’s only half a block from the edge of Kapiolani Park and approximately five blocks from the surfboard rentals/best beginner surfing spot. It has a simple but nice swimming pool overlooking Kalakaua Avenue, and there’s often live poolside entertainment. Unfortunately, this hotel is quite a distance from the Hilton fireworks. Check Rates and Availability at (ad) Hotels.com : search keyword "New Otani Kaimana". 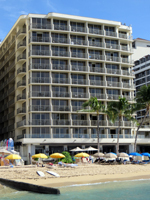 The Kaimana also appears to be one of the nicer beachfront Waikiki hotel bargains; but it’s also the only one that’s NOT located in the area commonly identified as Waikiki (from the Ala Wai Boat Harbor in the west to the western edge of Kapiolani Park). Nevertheless, it’s sitting at the foot of Diamond Head on the far eastern end of Waikiki Beach. 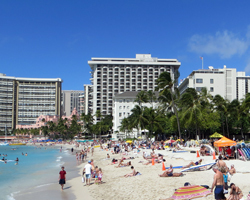 As the most remote of all the Waikiki Beach Hotels, it has an almost exclusive stretch of sand adjacent to the Waikiki War Memorial Natatorium portion of Kapiolani Park. You just have to accept that it’s fairly remote… a full kilometer (0.6 mile) walk to the closest Waikiki activities and 2.25 km (almost 1.5 miles) to the center of Waikiki. That might be the best thing about this hotel or it could be the worst – it just depends on your perspective. Check Rates and Availability at Hotels.com (ad). Hawaii Vacations: Save 30% or more in paradise! 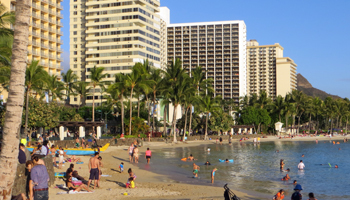 : search keyword "Park Shore Waikiki". Again, depending on your perspective, this could be one of the nicest of the budget Waikiki Beach hotels because it’s located at the eastern corner of Waikiki. Judging by the way it’s built, many of the guest rooms have unobstructed views of the beach, Kapiolani Park and Diamond Head. And based on its prime location, this hotel has direct, unhindered access to more sand and seawater than any other hotel in Waikiki! It too has a simple but nice swimming pool overlooking the roads below. It is, however, several blocks from the center of Waikiki activities… and even farther from the Hilton fireworks. Check Rates and Availability at (ad) Hotels.com : search keyword "Aston Waikiki Circle Hotel". I notice this hotel every time I go past because it looks so small and outdated next to all the bigger, fancier Waikiki Beach hotels surrounding it. 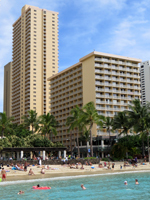 Then I think to myself that the Circle Hotel is situated in one of the best locations on all of Waikiki Beach – approximately four blocks from Kapiolani Park and nearly twice that many from the center of Waikiki! It’s located almost directly across the street from the Waikiki hula mound (where they have the free hula show), the Duke Kahanamoku statue, and the surfboard rental outfits. I’ve heard that the guest rooms are newly renovated (so the outward appearance might be deceiving); and I’ve seen that it has a very popular restaurant (based on the crowds that line up out onto the sidewalk). I can’t imagine there are too many other amenities, but for a Hawaii beach vacation on a budget, this hotel doesn’t seem to be lacking in value. 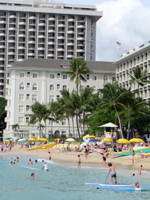 Check Rates and Availability at (ad) Hotels.com : search keyword "Aston Waikiki Beachside Hotel". This little boutique hotel is squeezed between the much grander Hyatt Regency and the Waikiki Circle Hotel (which I can’t help but notice). As a result, I’ve gone past the Waikiki Beachside Hotel hundreds of times without ever paying it any notice. The exterior design is completely unremarkable; and I imagine the interior amenities are similar. Nevertheless, it’s directly across the street from the Waikiki hula mound and one of the most popular stretches of Waikiki beach. So if you’re looking for cheap Hawaii hotel deals directly fronting Waikiki Beach, this hotel is probably impossible to beat! I’ve only been at the Hale Koa for entertainment and meals; and there’s a very good reason for that… I don’t qualify to stay at this Waikiki Beach hotel (except possibly as a guest of my in-laws). That’s because out of all the Hawaii vacation resorts on Waikiki Beach, only this one caters exclusively to U.S. Armed Forces personnel and retirees as well as to certain government service employees. So you’ll have to determine whether you’re eligible to stay here before you can even begin to worry about room availability. And then, rates vary by your rank. 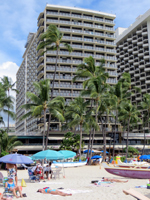 So for those reasons, I didn’t include this Waikiki Beach hotel on the affordable list above. Nevertheless, if you do qualify, a stay at the Hale Koa could mean a great deal on one of the nicer Waikiki Beach hotels. It’s located right near the Hilton Hawaiian Village on the very large piece of property that is Fort DeRussy. Thus, it has a huge section of beach and even bigger gardens and grounds. It also has a great view of the fireworks. Check Rates and Availability at (ad) Hotels.com : search keyword "Halekulani". I don’t know any better way to put this... but out of all the Waikiki Beach hotels, this one is absolutely the most expensive for a standard room. So what are you paying for? Some of that price reflects the central Waikiki Beach location (next to the Sheraton Waikiki). But from what I can tell, most of what you’re paying for is elegance and exclusivity. Everything always looks very trim and well manicured; and the pool-bottom tile mosaic of an orchid is incredible. Furthermore, they definitely keep out riffraff like me. I think I was escorted out of that hotel five times in my younger years. The first time I was trying to sneak into that beautiful pool, so that was a fair catch on their part. None of the hotels let you sneak in their pools. But the other times were just because I tried to cut through from street to beach and/or walked into the wrong hotel by mistake. The hotel security is very alert. And just in case you’re wondering… I have been to this hotel for legitimate purposes such as events and meals. They didn’t throw me out on those occasions. I found cheaper rates for this resort at (ad) Hotels.com : search keyword "Outrigger Reef". Of all the Waikiki Beach hotels, only the Outrigger Hotels are a Honolulu-based local brand, which means they tend to be especially friendly to local residents like me. I’ve been to this hotel many times to eat at the Shore Bird Restaurant (one of my favorite Waikiki restaurants) and for various other entertainment. All of my experiences have been positive and didn’t involve getting thrown out. For that reason, I assume they treat visitors equally well or even better. This hotel is located just a little west of the center of Waikiki on a nice stretch of sand and very near to the park areas at Fort DeRussy. It has a view of the Hilton fireworks. 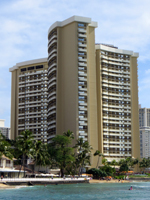 I found cheaper rates for this resort at (ad) Hotels.com : search keyword "Outrigger Waikiki Beach". Like I mentioned above… of all the Waikiki Beach hotels, only the Outrigger Hotels are a Honolulu-based local brand, and there are several of them throughout Hawaii and the Pacific. This particular Outrigger Hotel is located directly across the street from the International Marketplace, squeezed in-between the Moana Surfrider and the Royal Hawaiian Shopping Center and hotel. I’ve also been to this hotel for entertainment. 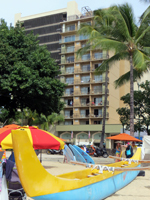 It’s easy to overlook because of its location between two bigger, older, more-elegant hotels; but it still has a prime piece of beach near the rental surfboards and all the various Waikiki attractions on Kuhio Beach. I’m fairly certain that it does not have a view of the fireworks. 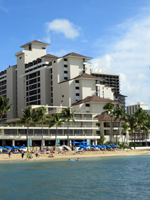 I found cheaper rates for this resort at (ad) Hotels.com : search keyword "Waikiki Beach Marriott". Let’s face it… if you’re a dedicated member of the Marriott Rewards program, you’re probably going to want to stay at this hotel. It’s not last in this list for any reason other than alphabetical order. 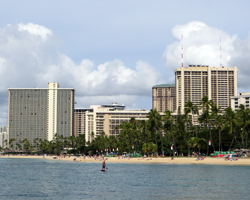 It’s a nice, rather large hotel located just one block from Kapiolani Park and directly across the street from a nice stretch of Waikiki Beach. Beyond that, I’m not sure what else to tell you except that this hotel is reminiscent of every other Marriott hotel I’ve ever visited. If there’s one thing Marriott does well, it’s consistency. *Sample room rates reported above are in $US and intended only as a snapshot of the rates published directly by the various hotels using their online booking tools in December 2013. They are provided exclusively for the purpose of convenient seasonal comparison. Rates are per night for two adults in one standard guest room at the lowest non-promotional price. Rates were obtained for the following dates in 2014: January 15-21, April 15-21, July 15-21, and October 15-21; and rates marked as NA were not available for the requested dates. The rates published here are only samples based on my research on a single day in December 2013. They do not represent a price guarantee or quote to you. You must still obtain you own hotel pricing information based on your booking/travel dates. **If you’re wondering about the grandest standard hotel rooms I've ever stayed in, they were the Ritz Carlton Hotel Arts in Barcelona, Spain and the Four Seasons Lodge at Koele on the island of Lanai, Hawaii. Those are hard to beat. But they’re not on Waikiki Beach, so obviously they can’t have everything.